Fallbrook Technologies in Cedar Park, Texas, created the NuVinci® continuously variable planetary (CVP) bike transmission. It replaces the cogs, gears and derailleurs that have typically been standard issue on multi-speed bicycles. The CVP design enables riders to continuously, seamlessly and silently change a bike’s drive ratio. It is not uncommon for Fallbrook to push the envelope with the new designs its R&D department brings to life as prototype parts. Surface finishes are crucial, as is the ability to machine hardened materials—usually under tight deadlines. The company is also very concerned about tool life and part cost. Fallbrook’s commodity vertical machining centers had reached their limits on meeting these attributes. 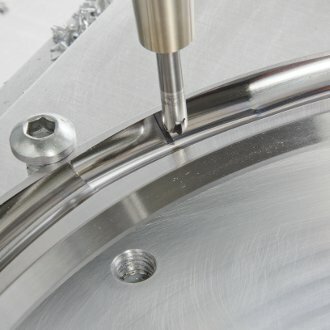 The company decided to find a precision machining center that would help it move its prototypes into medium-volume production on its strict time frames. As it considered which precision machining center to purchase, Fallbrook evaluated suppliers that could handle its needs and visited several to run sample parts. Makino was the first to meet Fallbrook’s prototype part requirements by using the Makino V56i vertical machining center. A cost benefit analysis showing machine payback within two to three years, along with tight tolerances and surface finishes, led Fallbrook to choose this solution. • Speeds and feedrates increased by 35 to 65 percent on typical applications. rigidity also enabled the tools to perform at their upper limit. • Tool life grew more than 300 percent in certain applications.